Head downriver fra sentrale London til Royal Borough of Greenwich, for en halvdagstur. Besøk Greenwich Royal Observatory i Greenwich Park, beundre Painted Hall i Old Royal Naval College og tur National Maritime Museum. Etter en kaffepause på museekafeen, hent opp noen unike suvenirer fra Greenwich Market, og undersøk deretter om nylig den nylig restaurerte Cutty Sark teaclipper. Wow! This was wonderful! We encountered two groups that met at the same statue but left a few minutes earlier than ours, both having at least 50 people in them and no way to hear the guide at the front of the group. Figured we had chosen one of those tours when our tour guide and ONE ADDITIONAL PERSON came up. Fantastic! 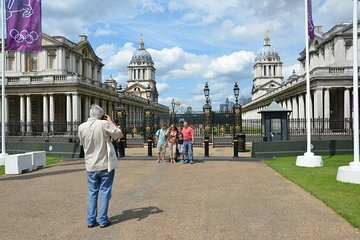 This tour ended up being through Greenwich Royal Tours, and we had Graham Bleasdale as our tour guide. He was wonderful, very knowledgeable, and totally willing to let us direct the time based on our interests. It is a very steep climb to the Royal Observatory, but he had a great feel for the time and got us there with 5 minutes to spare to see the red ball rise at 1PM which unfortunately it didn't the day we were there due to being hit by an electrical storm the night before - the origin of keep your eye on the ball for ship's captains to set the proper time! My husband was fascinated with the longitudinal devices so we spent a bit of extra time there, and Graham made sure we got our picture on the Prime Meridian without the addition of other tourists. Very nice! Back down to the Cutty Sark, Naval College, and all the rest, with our guide knowing the all the details and fun facts, in addition to the best stairs to climb and the best order to see everything with the least amount of crowds. An amazing tour, with an amazing company and guide. We felt so lucky to have purchased this tour, and so sorry for others taking the regular tours! We really enjoyed our tour of Greenwich highlights! Graham our guide was extremely knowledgeable and enthusiastic about all of the places we visited. He has a unique gift for sharing historical information in a way that makes it vivid and real. He is also really good at responding to questions. He gives clear answers and then adds additional relevant information to deepen our understanding and appreciation. That is one of his real strengths -- adapting the tour to our questions and interests. We also appreciated how he put Greenwich in context - showing us the old and new developments on both sides of the River and providing historical background that deepened our appreciation. For example, he made a point of drawing our attention to a large red ball on a rooftop, and then, after the ball dropped, he described the falling ball's historical role as a signal to ships on the river that it was noon. The dropping ball was not entertainment, but an important part of coordinating daily activities on the river. We were especially interested in the royal observatory because of the historical and scientific significance of longitude and how that helped determine a ship's location at sea. Graham did a great job of explaining that and showing us the museum exhibits for a really vivid experience of the development and verification of longitude. We also really appreciated his knowledge of architecture and his explanations of different architects, their unique building designs, and how social forces can influence design e.g., making sure views are maintained and not obscured by new buildings. The tour of the Cutty Sark was also wonderful - we learned so much about clipper ships, their role in commerce, and how the sailors lived on board. It was absolutely fascinating. Graham makes learning vivid and fun! In sum, it was a wonderful tour. Graham is knowledgeable and a great teacher who kept us interested the whole time. I would recommend his tours to anyone. Great afternoon. Greenwich had so many interesting aspects. Our guide, Graham, was very well informed and shared so much interesting information. Really enjoyed it. Learned a lot about different things in Greenwich. Definetely recommend! Mr. Graham was very friendly, knowledgeable and made the tour very interactive.